Have you ever sat and looked at the seeds you sow in your garden? I mean, really looked at the seeds? Is the above a meteor or a seed? I came across this photo blog of things under microscope recently that has a few cool shots of seeds. The picture above is of a poppy seed 40x (1) Coming across this now reminds me that I'll be sowing my poppy seeds this February for spring blooms. 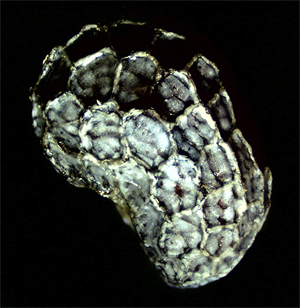 This micro photo of a hosta seed really blew my mind. Compare it to what hosta seeds look like to the naked eye. You can find more pictures of seeds and plant life under microscope or buy a print at Micro Photos. Hmmm, I think I'm going to have to take some seeds and my camera to Pete's lab class and look at them under the microscope!! Make sure to take pictures!